During our "Grand California Tour" we simply had to visit Seaworld San Diego. Not only had we heard it's one of the prettiest of the many Seaworld Parks but also their newest addition, Explorers Reef, was set to open very close to our visit. 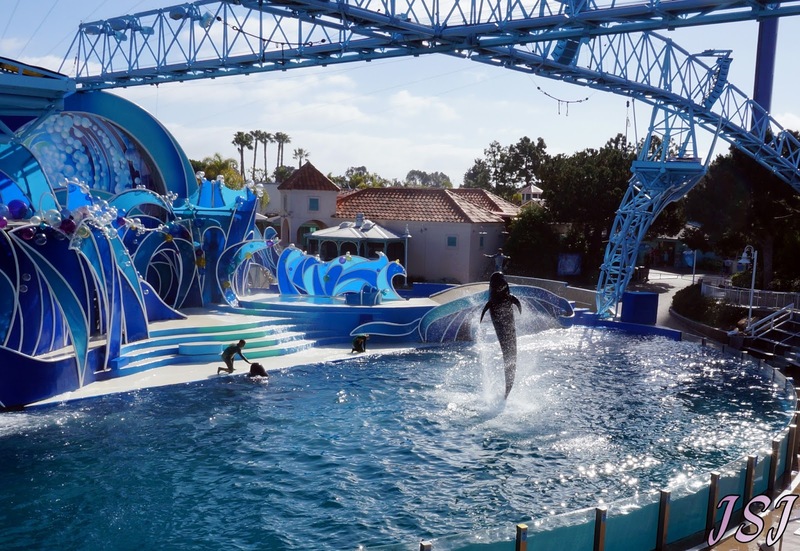 Seaworld San Diego is located in San Diego California, in the Mission Park area. It's about an hour and a half south of Anaheim in the far southern reaches of California. It's far enough out to be separate from other area theme parks but fully stands on it's own as one of the loveliest parks we've had the pleasure of visiting. 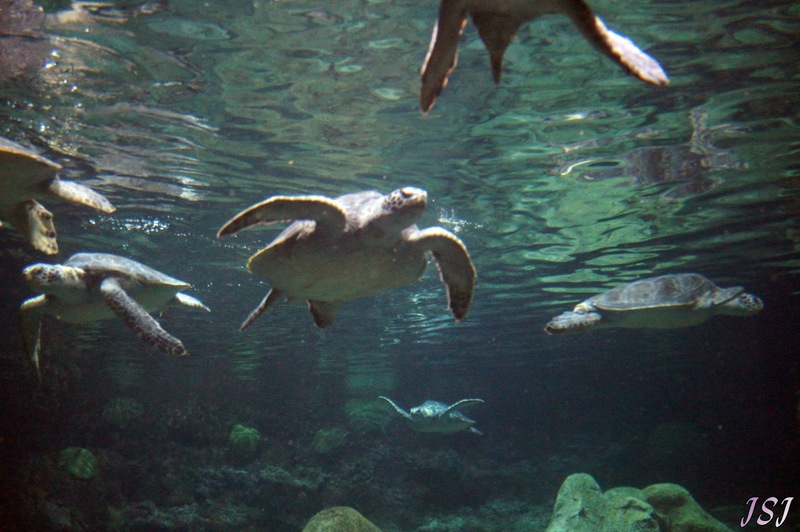 Seaworld San Diego is the original "SeaWorld" park, founded in 1964 by four UCLA graduates. The park opened originally with only Sealions and Dolphins as their marine mammal attractions, the parks iconic"Shamu" Killer Whales didn't come to the park until 1965. "Shamu" wasn't originally captured for Seaworld but was purchased from a Seattle Aquarium. 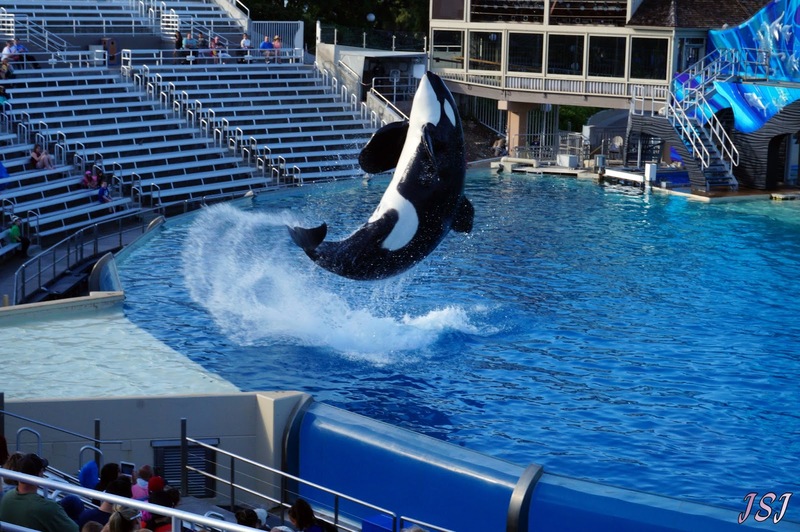 Seaworld later added additional parks in Ohio, Florida and Texas over the coming years. They changed ownership several times over it's 50 year history, the most noted and longest owner being Anheuser-Busch who grew Seaworld into a household name. 2014 will celebrate Seaworld's 50th Anniversary which will be celebrated in all the current Seaworld parks, called "A Sea of Surprises". 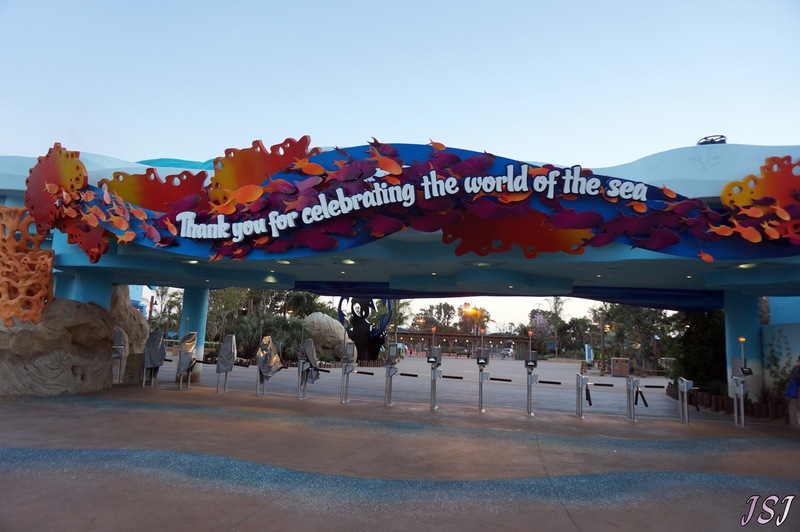 As part of Seaworld's 50th Anniversary, "A Sea of Surprises" the park in San Diego made some massive changes to their entrance plaza. While the Grand Opening of Explorers Reef isn't until March 21st, Seaworld San Diego has been opening the area slowly to guests. 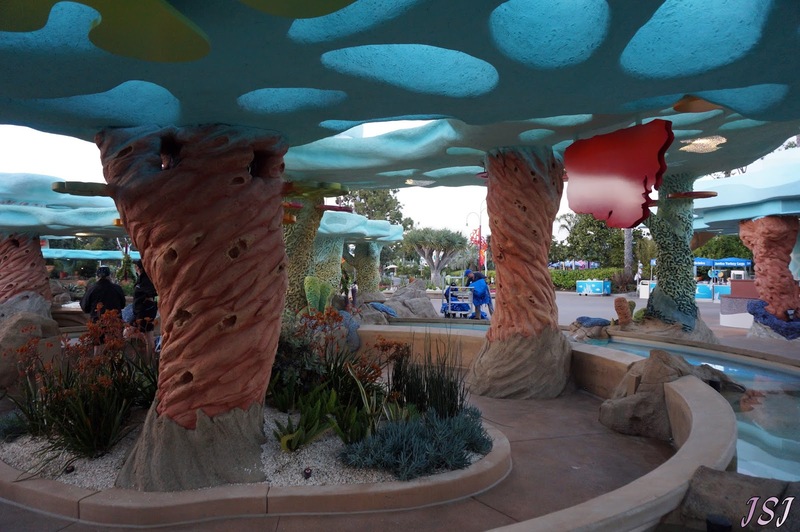 We were lucky enough to be invited to visit Seaworld San Diego but even more to our surprise the new area of Explorers Reef has just soft opened, much to our delight. After collecting a frosty adult-style beverage, we parked ourselves in a lovely shaded spot and consulted our map. Seeing we arrived at a nearly too perfect time and had over an hour before the next show. We eyed up Journey to Atlantis for several moments, giggling at the dripping wet folks coming off the ride. Surprisingly, this JtA attraction differs greatly from the ride I was familiar with in Orlando. After a quick consult with the group, we opted not to get soaked and headed towards the many animal exhibits. Our first stop was Wild Arctic. In this attraction you can choose to be transported to the "arctic circle" via a motion simulator attraction or a walking tour (motionless movie). We chose the walking tour and then headed deep into the icy themed area. Inside the theme flows, all around you see what one would expect to find in an arctic base camp. From supplies, to icy structures and even an antiquated boat trapped in the ice. As you follow the twists and turns you'll encounter several exotic arctic species of marine life. 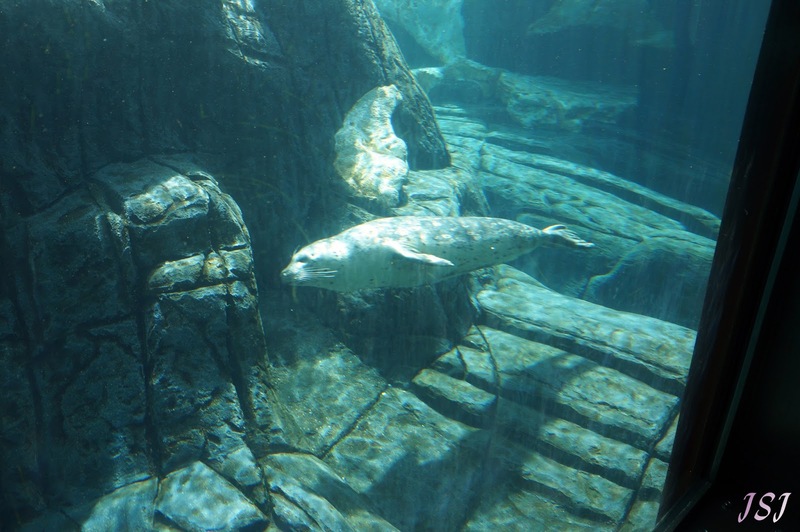 Beluga Whales swim and play happily in well themed, large exhibits. Allowing guests to view them from both above and below water. These animals are both adorable and majestic, something about a marine animal having adorable little "blubber ridges" just gets me. If you follow along you'll also encounter a walrus. Giving a little look into just how small a critter we humans really are. 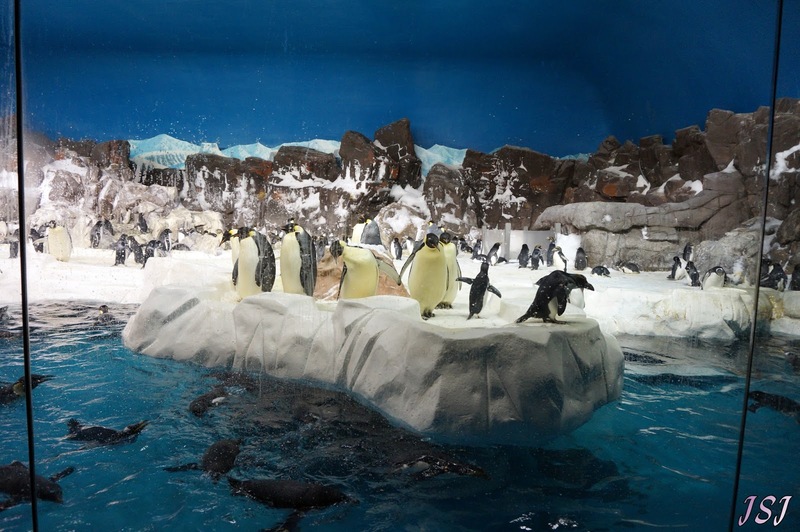 All through this exhibit you'll find educational stations which tell you about Arctic Animal conservation and the threats that these animals face. Educators are at every exhibit to give presentations and answer any questions guest have about these animals. Although we did find the polar bear exhibit empty, surprisingly we found they had been moved to our own hometown zoo, Pittsburgh Zoo and Aquarium, as part of an on-going breeding program to help conserve polar bears. Up next we headed toward Penguin Encounter. Outside we found a lovely island hosting tropical penguins as well as animal care techs hard at work making sure the animals had plenty to eat and general vet care. Moving along I had to stop dead for a moment, it was like I walked back in time and was suddenly "home" again. San Diego's "Penguin Encounter" is nearly a replica of the previous penguin exhibit at Seaworld Orlando, at which I spent a large amount of time. From the smell of birds and saltwater to the music. Honestly, I had flash backs! Home to several species of penguins, which I quickly pointed out to the rest of the team. From the moving walkway to the viewing area, it was a pleasure. Then the joy happened- PUFFINS! 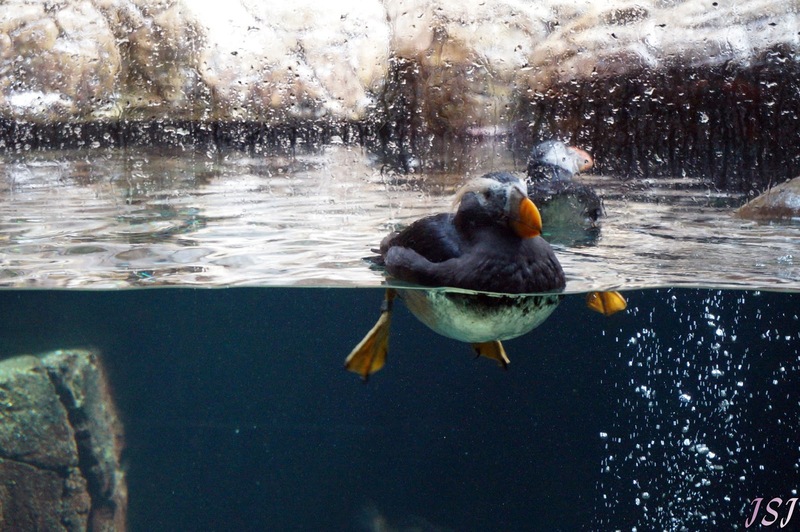 They have puffins! I love puffins, I don't know why. They're cute, they're adorable, they're comical and I want to compulsively cuddle them even though I know they're a wild animal (I have the same reaction to big cats, don't ask). After watching for a few minutes I'm fairly sure both Alex and Kitsune shared my opinion of these unique and beautiful birds. Finally dragging "Tour Guide Carrie" along, we grabbed a few gifts from the gift shop and headed onwards. Turtle Reef was our next stop. With none of us being too familiar with turtles, we found this area to be massive and filled with life. Several different species of turtles swam in safety alongside schools of fish, they also had an interactive cell-phone app which many folks seemed to be really enjoying. More educators giving lectures and answering questions were found here. As they were swarmed with kids and families we listened to the dangers to wild turtles and how people are working to protect them before moving along. Inside we also found a game that lets you play a turtle rescue mission. Sadly, this had a long line and we were trying to fit a lot into a tight schedule, so we moved along. Right near the turtles we spotted 'Shark Encounter' and always being game, we headed inside. This area was a surprise, the inside is themed like a tropical paradise as sunset. 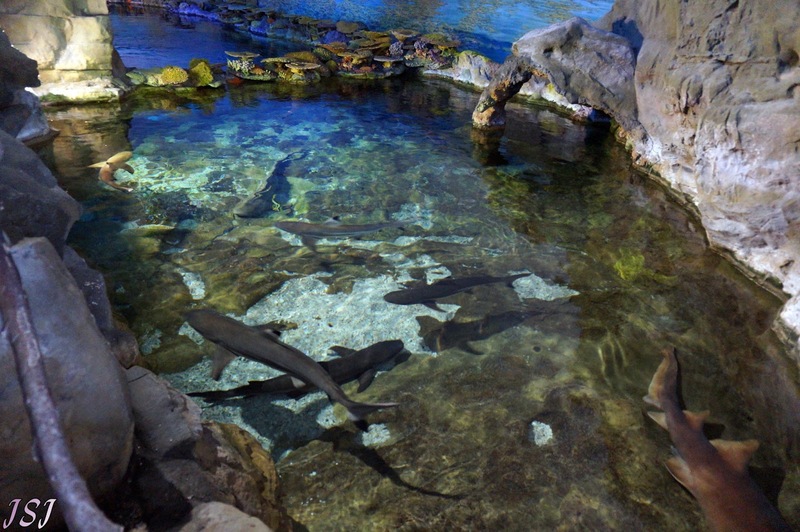 The sharks swim in various tanks, from tide pools to deeper ocean-like tanks. With both above water and underwater viewing, you can get a great look at this predators. From reef sharks to nurse sharks, a variety of species call this area home. You can get an even better look from their underwater tunnel, stepping on a moving sidewalk you slide along under the 'water' while sharks swim all about. Encounters like this let you suspend your reality and pretend to be among the hunters of deep for just a few moments. Finally it was time to get moving, the lull in the shows was kicking back up and we didn't want to miss anything. So heading out of Shark Enounter we headed for our first show of the day- Sealion's Live! The Sealion and Otter shows have always been the comedy show at Seaworld parks and "Sealions Live!" delivers perfectly. Each park always has a different show, 'Sealion's Live' is based off various TV shows with hilarious results. From the pre-show involving stage-hand "Biff' who entertains the crowd with a generation trip though hit music, to the show which mimic's greats such as "CSI" and "Dancing with the Stars"- this show has all the laughs you could wish for. 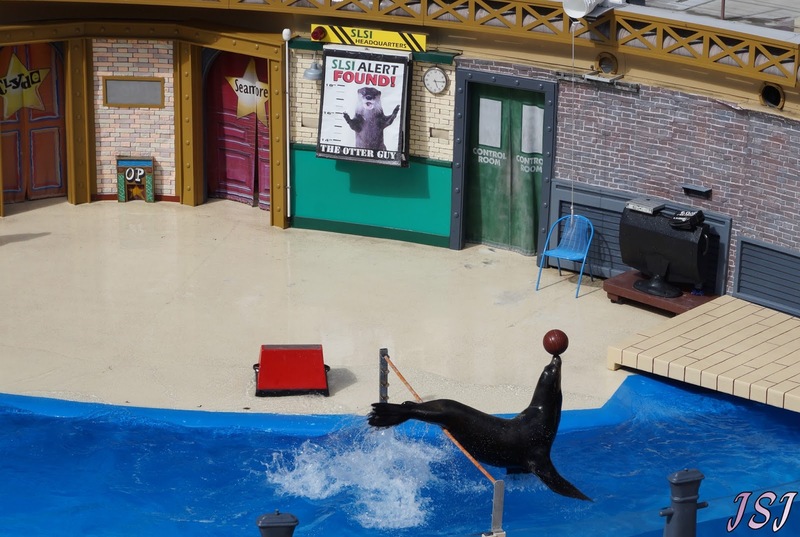 Sealions and Otters perform beside their trainers, acting out the spoofed TV shows allowing guests to both enjoy the sheer agility of these marine mammals but in a fun way. As much as I enjoy the other shows, I have to admit- The sealions have always been a personal favorite! Afterwards, we had a few minutes so we stopped Pacific Point where you can see Sealions in a more natural habitat. This is also the area where you'll find the educators teaching about these animals, while we looked they happily answered the many questions while another gave a lecture about the animals. For a few dollars you can pick up a tray of specially prepared fish, allowing you to get in on the action and feed these animals yourself. For some reason, no one else was willing to touch sealion-food so it was up to me- armed with a tray we became highly popular with the sealions. From barking to attention seeking, these guys know a free meal when they see it! After a few minutes we were out of fish but also needed to head out to our next show- after a quick hand-washing that is! Blue Horizons was our next show. Dolphins and Pilot Whales are the stars of this pageant involving a human's dream of dolphins and the ocean. Weaving the two together give the viewer a mix between animal interaction with humans, a "cirque" style show and adding in spectacular diving stunts leave this as truly unique experience for the guest. This show is also found at Seaworld Orlando but if you visit San Diego, you in for a special treat. 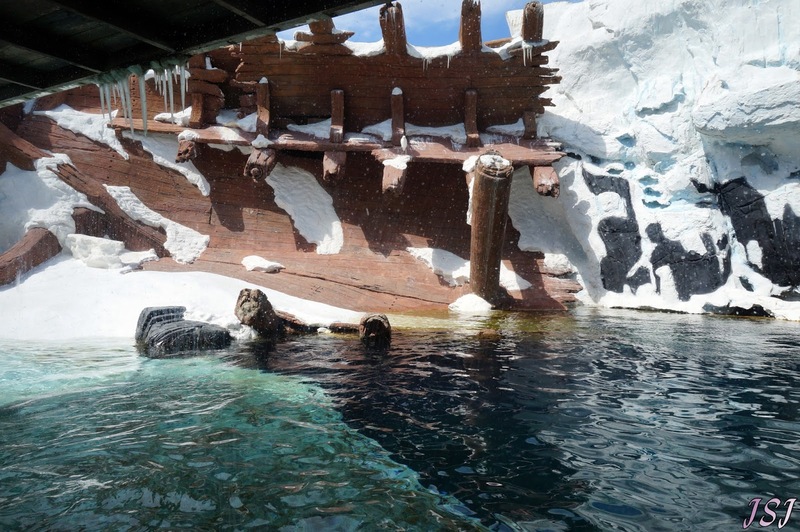 This version of Blue Horizons still has water-work with their dolphins, allowing humans into the water with these animals truly is the way to demonstrate them. Only this way do you get a sense of size, power, beauty and sheer agility that dolphins have. Along with the bottle-nosed dolphins, you're in for an even bigger treat- the pilot whales or "false killer whales" also have a big part in 'Blue Horizons'. As if this show didn't have enough to look at already, they also play host to the three only performing and jumping pilot whales in America. This beauty leaps and allows you to glimpse the true size and agility of the often misunderstood mammal. You won't find something like this anyplace else, so sit back and watch. Because 'Blue Horizons' is a treat for the sense and the eyes- if you visit make sure this show gets into your busy day, it's worth every moment! After a quick stop for some shopping, a funnel cake and a refill of an adult-beverage type nature we headed for the big show. The one we were all looking forward to- One Ocean. The new show which features Seaworld's iconic Killer Whales. Thankfully during the week, the park was busy but not packed. Allowing us to arrive a bit later than normal to the show but still able to snag some amazing seats- well out of the splash zone (we know better!). While waiting we chatted with an employee of the show and found out that San Diego is also getting the "rescue" floor installed in the far back tank. This addition can also be found in Orlando. Since the show was about to start we all headed to our seats and watched the pre-show. One Ocean is the newest version of the "Shamu Show" involving education on both the oceans and conservation but most of this gets lost as you've got your eyes locked on the Orcas. When one leaps your heart goes with them- so many descriptive words I could add in here but none of them seem to do this animals justice. Using actions found in the wild, the Killer Whales show you a world normally hidden to humans above the surface of the water. Allowing you a look into their world, you can't help but fall in love all over again. 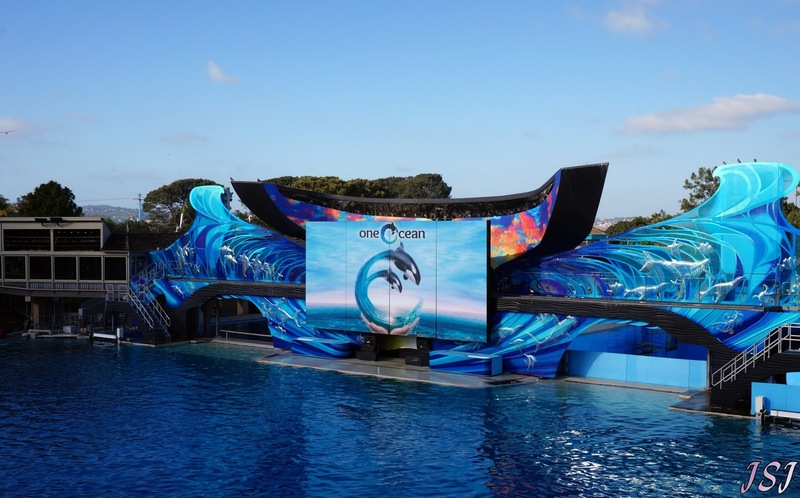 Between the amazing scenes found on the stadium's four massive screens, the beautiful animals and a bit of humor- One Ocean is the premier show at Seaworld San Diego with the biggest and most famous animal stars in the world. Regardless of where you many stand on the current debates about "Seaworld" no one can deny the beauty and educational impact of this amazing animals. Seeing them in person will have an effect, you can't deny that seeing one up close inspires every person in multiple and various ways. Finally our day was drawing to a close, after a short break we had time for one final attraction. 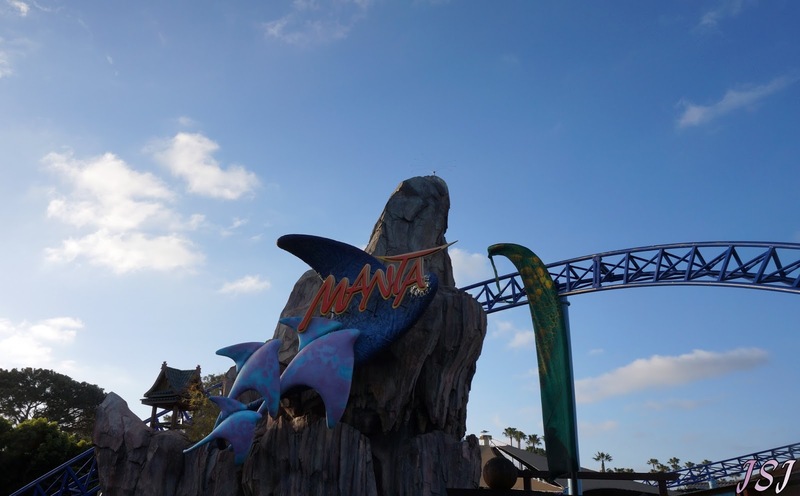 Since Seaworld San Diego has a version of "Manta" and we do love our roller coasters- this couldn't be missed. We headed into an empty line queue and jumped on the very next ride. Sharing the same name with Orlando you'll find this version of 'Manta' very different. Rather than a flying coaster, you'll find a highly themed, multiple launch coaster. 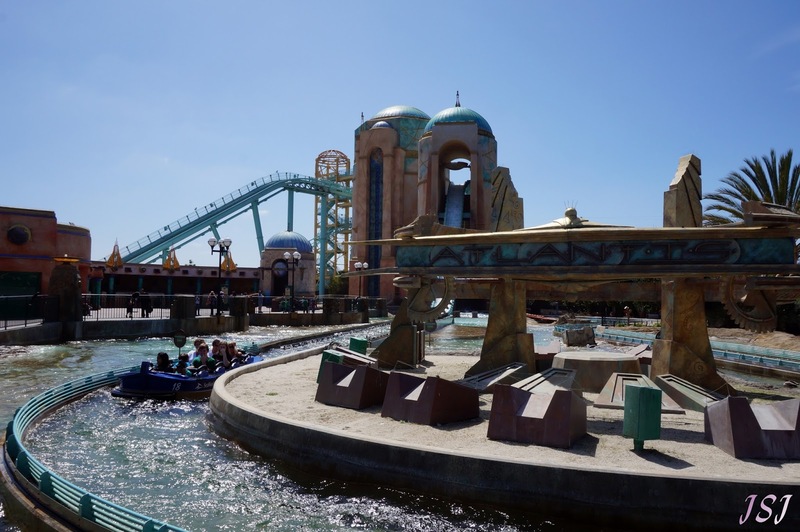 Sending you through a pre-show before your first launch you then dive into the water, swim among the huge manta rays and then you're launched onto a thrilling roller coaster which twists you about rock formations and stingray ponds. Our day was over. While we enjoyed every moment, it left us wishing for even more time in this park. More time to learn, to interact and simply experience the animals found here- in a world open to those who can't breathe below the waves. 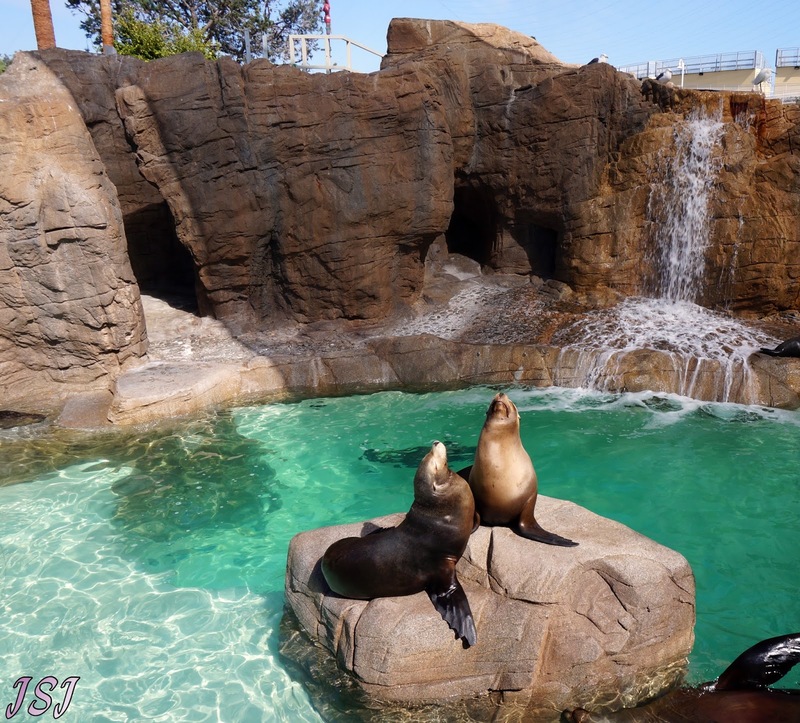 Seaworld San Diego is both a beautiful and educational park, allowing you to either experience it for the simple pleasures or learn as much as you can as you go. Without a doubt it will re-kindle your love for animals and the oceans anew, leaving you with the sense that these animals and all animals need our care and protection. If that isn't a good message to send to people and future generations- then I don't know what is. 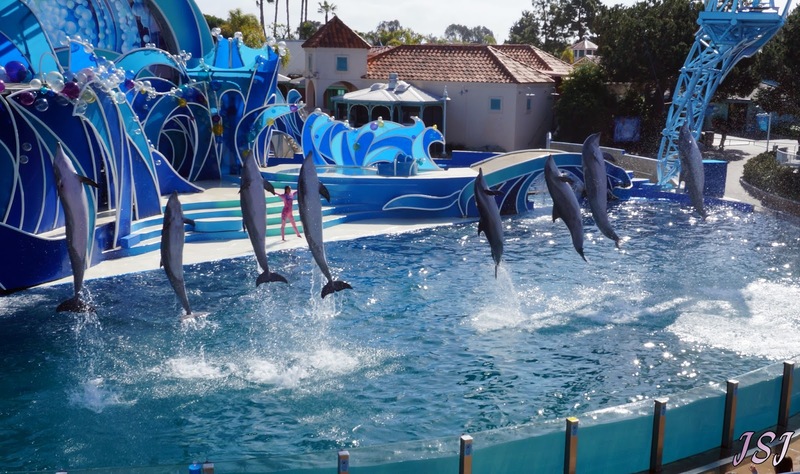 We hope you've enjoyed our review of Seaworld San Diego as much as we enjoyed visiting the park. As always, Seaworld can be a hot topic to some people. Please keep your comments polite and on topic, this is NOT the post in which to voice your opinions on Seaworld as a company- this post is for the review of the park and comments regarding it.. Any mean, foul, rude or nasty comments will be deleted without mercy.